Tickets are available to purchase from the retail shop at http://www.paperartsy.co.uk/ after 8.00pm GMT on Monday 13 September, 2010. Please read full terms and conditions before booking! AArrgghhhhh!!........ How utterly gobsmacking! I will book the day off work - this is just fantastic. ooh I will try to book Liz & I into a session - but please tell me that the Disappointed Ones - will still get an arsty craft chance to see you and Leandra and the Ladies Who Help Teach Us later in the year? CONGRATS LADIES!!!!!!!!!! Whoo, hoo! What a fabulous event. To use one of my favorite words from you guys over there.."simply gobsmacking!" Oooh, salivating at the thought. I'm so excited! 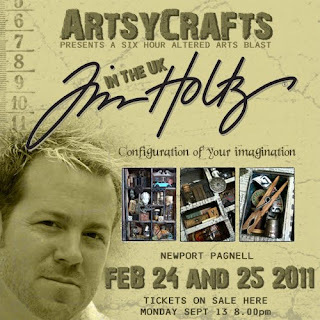 The ArtsyCrafts events are truly awesome but having Tim Holtz along too is totally gobsmackingly brilliant! Thank you so much. I wish I lived in the UK... Have great fun!! Wow, what a fantastic opportunity, well done ladies. Its a week after my 40th birthday, so going to ask hubby if he knows what to get me?! (I live NO WHERE near the venue, but this is TOO good an opportunity). Wow, Wow and just in case I didn't make myself clear...WOW!!! I shall be hovvering over the computer at 8on Monday trying to type with my fingers crossed hoping to get a place. How brilliant are you! Utterly fabulous, I shall be up at dawn on Monday ooooohhhh so excited and cannot wait. Contgrats to you and Leandra for organising this event. How will I ever wait and eat and sleep til Mondag's registration. Thanks Lin , Leandra and Tim for this oportunity. Hope I'm one of the lucky ones. Oh wow! This will be THE event of the year! Monday evening is going to be nerve-racking - how will we know if we're successful? Hope you're ready for the stampede!!! very excited in Staffordshire!!!! Me again - one question! Does booking open at 8pm GMT i.e actually 9pm British Summer Time, or is it 8pm BST? Fantastic, fantastic i hope i manage to get a place.